This is journal management and publishing system that has been developed by the Public Knowledge Project. OJS assists with every stage of the refereed publishing process, from submissions through to online publication and indexing. 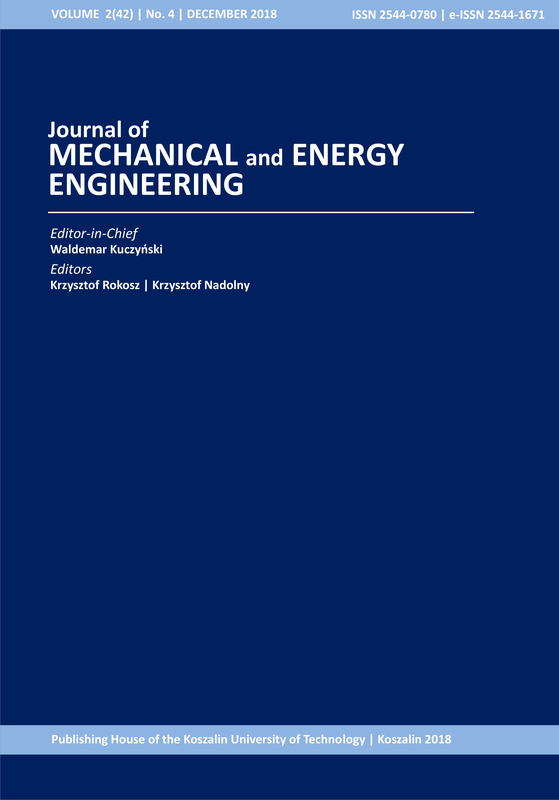 The Journal of Mechanical and Energy Engineering (JMEE) as a continuation of Scientific Journal of Faculty of Mechanical Engineering of Koszalin University of Technology (pol. Zeszyty Naukowe Wydziału Mechanicznego Politechniki Koszalińskiej) published in Polish between 1975 and 2007. Resumed in 2017 in a new form, the Journal of Mechanical and Energy Engineering (JMEE) publishes manuscripts on research, development and design related to science and technology in a field of Mechanical Engineering and Energy Engineering. A peer-reviewed interdisciplinary JMEE is published two times in a year in an open access formula. There is no publication fee for the Authors of articles. The journal accepts manuscripts of two different types: original research papers and review papers. The JMEE publishes original manuscripts from a broad range of problems related with a modern Mechanical and Energy Engineering. Copyrights © 2017, Journal of Mechanical and Energy Engineering (JMEE).